Darren Bazin demonstrates how to forge a tool drift from 9 inches (225mm) of 7/8 inch (22mm) round tool steel. 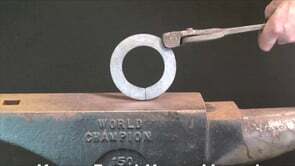 The drift is used for creating an oval hole in stamps, fullers and other tools where a wooden or riveted handle is required. Running time 4m 15secs. Darren Bazin demonstrates how to forge an unwelded eye from 9 inches (225mm) of 5/16 (8mm) round. This is a useful exercise to develop bending techniques aswell as improving hammer control on light material. This exercise forms part of the UK’s forging certificate for pre-farriers. Running time 4m 28secs. 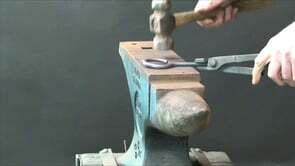 Darren Bazin demonstrates how to forge an unwelded ring from 11 inches (275mm) of ¾ by ¼ (20mmx6mm). This exercise works on developing not only the bending techniques but also some basic upsetting of the material. 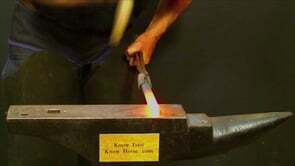 This exercise forms part of the UK’s forging certificate for pre-farriers. Running time 4m 44secs. Darren Bazin demonstrates how to forge a welded handle stamp from ¾ inch (20mm) round tool steel. This E head stamp is used in concave and light fullered shoes and is arc welded to a metal handle. This movie relates to element 1.2 of the National Occupational Standards in the UK. Running time 4m 51secs.